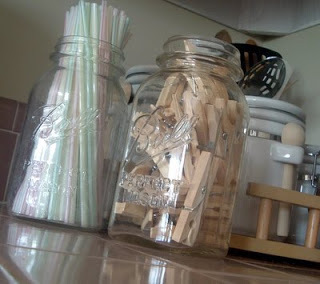 Yes long before I discovered blogging, I loved jars. Old canning jars are like my drugs — can’t get enough. It seems that there is a fad however and jars are the things to have. And let’s face it — they are versatile. 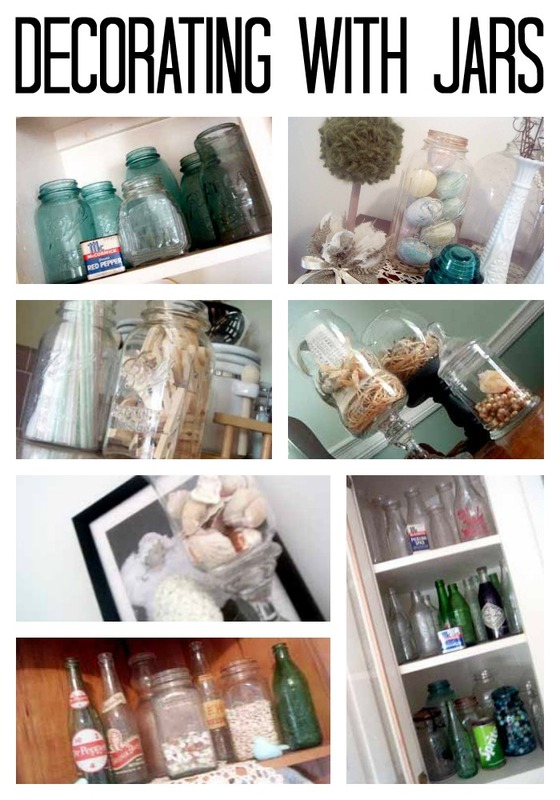 I thought I would share a few ways that I used jars in home decor. You can get some ideas below to try in your home. 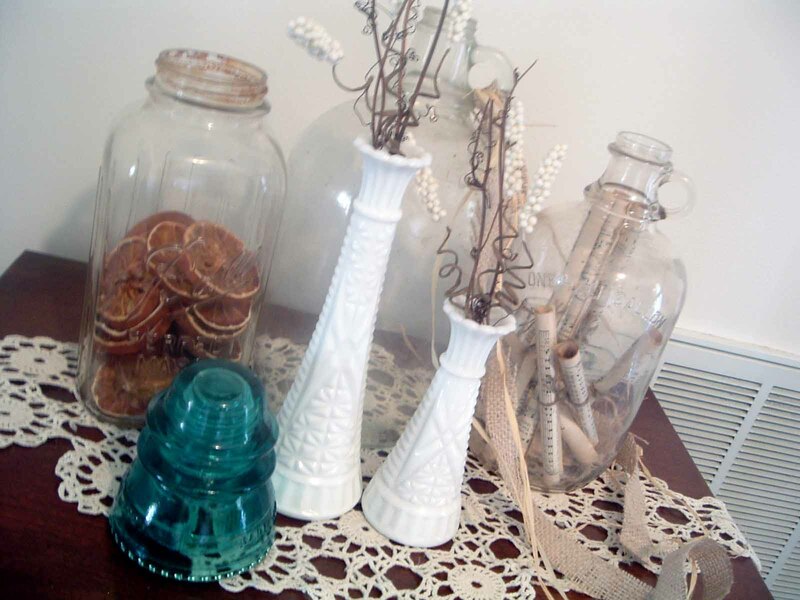 You can use vintage or new jars to create fun vignette displays around your home. Gather your jars and get inspired with our ideas below. 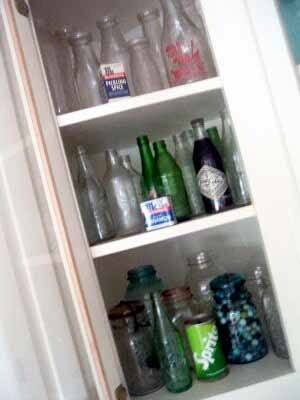 Please don’t leave out the vintage soda and milk bottles — gorgeous! Of course you can add various fillers to your jars to make them really pop. 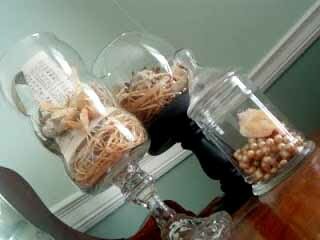 Above I have some jars with marbles that work perfectly with a vintage display. Dried oranges are easy to make and make a cute display. You can also add items to an old jug like my sheet music rolls. Of course, we cannot forget apothecary jars. Don’t hide those old pearl necklaces in your jewelry cabinet…display them in a jar! And what would any country home be without a touch of raffia. 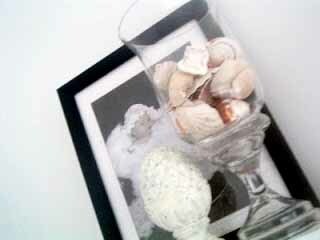 Seashells look great anywhere but work especially well in a bathroom. We can’t leave out Easter eggs in honor of the upcoming holiday. You can also display your extra beads and buttons for craft project in jars — take them out if you need em. Dried beans are gorgeous in a jar! I feel like that has to be the way my great grandma stored her beans. Even the most mundane of household objects looks like art when put in a jar. Are you addicted to jars? How do you display them? More ideas for fillers? Tell me about your jar obsession in the comments below. You might also try adding some mason jar lights or even mason jar wall decor to your home! previous post: What Would You Do With It Wednesday??? 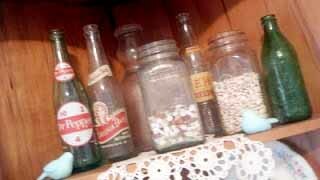 I have a small collection of old antique listerine bottles that I got at a flea market for $2 a bag! And a few small perfume bottles.. And I HEART apothecary jars and fancy bottles! Since I was a child Ive had a glassware obsession. Instead of dolls I collected decanters and old insulators! I love old jars and containers, too. Yours are great! I love using them for lots of different things. Your collections are neat; no need to explain yourself! Keep collecting! I don’t have a jar obsession but I sure enjoyed yours! I love all these old jars. You have a great collection and I love your use of them. Very pretty! I love your bottle collection! I have a bunch randomed placed around the house and outside. I’m using some for candle holders ala Pottery Barn! I love jars, too, and have been using to display things for years. Love some apothecary jars, too! Good heavens, you ARE a jar junkie, arent’ you? 🙂 I love jars too…there are so many uses for them. Especially fun are the old canning jars. I have a terrible time letting go of the ones that have measures on the sides! 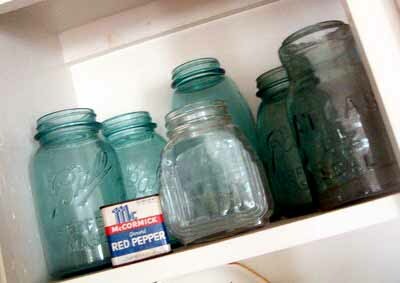 Angie, I love old jars too-especially the tinted ones. I have one filled with sea glass and a small jar with beaded flowers and old clay marbles in it. Some are filled with old silk thread on little wooden spools, some with buttons. What else? I forget! Have a happy Easter! I like old jars too. Most of my jars even some old ones have canned goods in them year after year! We were hiking the wood around our property today and found an old brown fat bottle of some sort. Of course,I bought it home with us. Thanks for sharing! I’m so in love with jars, jugs and bottles!!! I put flowers in them a lot, I actually only own one real vase! 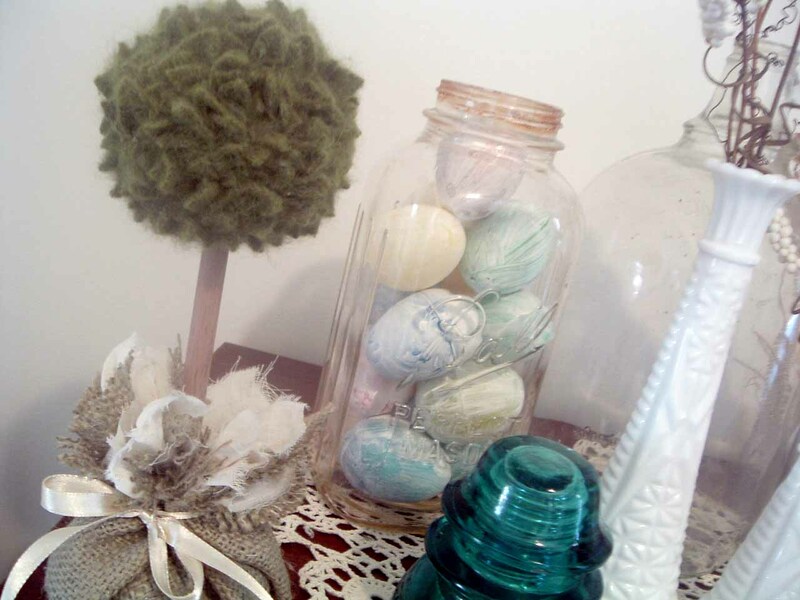 I made mason jar pin cushions and they are so so adorable, I want to make one everyday! They make good banks too! Glad to see I’m not the only one who is completely obsessed! Have you ever counted all of yours? Great post! We have a lot of antique jars and bottles too! Thanks for linking up for Friday Favorites! Oh you rock! For sure! I love these bottles, I too have a collection of my own…and of insulators! They are great! Oh ans pssst* I am your newest follower! Hi Angie! I love jars too. I love the way simple items can look pretty when they are displayed nicely. I love the jar of clothespins, I will have to try that if I ever have a laundry room. Have a wonderful week! I have a small collection of spaghetti sauce jars that I use to hold candy for rewards in my window cabinet…It’s made the boring empty space very cheery to see all the brightly colored sweets waiting for some good behavior to be rewarded!